Pork tenderloin is a delicate and lean cut. I love its open, tender grain and the fact it’s so simple to cook. Sadly, in relation to the rest of the pig, the tenderloin is really quite small, so, you must make the most of it when you come to cook it. I think this salad does it justice. It’s green with fresh herbs and full of vibrant flavors. Slice the courgettes into rounds, a fraction thicker than a 1 pound coin. Place them in a bowl, add the olive oil, garlic and some salt and pepper. Tumble everything together then lay out in a single layer over a large baking tray. Take the tenderloin and rub it around the bowl, gathering up the seasoning and oil that has been left behind. Nestle this onto the tray with the courgettes. Grill the courgettes and tenderloin for 6 - 10 minutes on each side until the courgettes are golden and tender and the meat is just cooked through. The cooking time will depend on how efficient your grill is and how close everything is to the element. Once cooked, return the courgettes to a clean bowl and set the tenderloin aside to rest on a chopping board. Chop the mint, chives and dill and add to the courgettes along with the sliced spring onion and lemon juice. Combine well. Slice the tenderloin into 1 cm thick pieces; I like to do this on an angle. 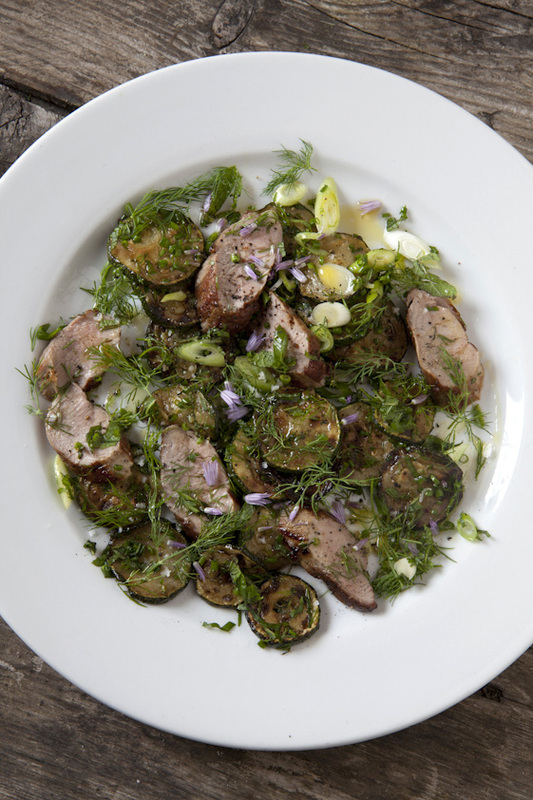 Turn the pork through the warm courgettes and season again with salt and pepper to taste. Divide the salad equally between 2 large plates. Finish with a few sprigs of fresh dill, some chive flowers, if you have them, and an extra trickle of olive oil.